Based on the latest 12nm process and using an enhanced process, AMD Ryzen 2000 processors offer an evolution over the 1st generation Ryzen processors. In both power consumption and temperature tests, we see the Ryzen chip putting Intel’s 14nm processors to shame. This is seen against both mainstream and HEDT lineups from Intel. 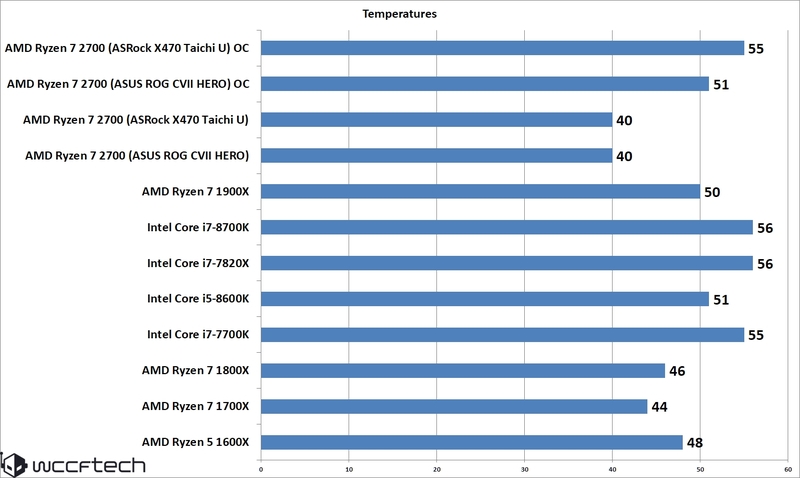 As for temperatures, we used our Cryorig R1 Ultimate with the AM4 retention kit during the overall tests. The results gathered during full load and under idle cases was pretty good. The chip remains cooler than Intel’s HEDT parts and even the new Coffee Lake mainstream CPUs which is impressive since they are using a 14nm++ process.